Purpose: Diabetes and periodontal disease are conditions considered to be biologically linked. Prediabetes is a condition in which individuals have blood glucose levels, impaired fasting glucose (IFG) and/or impaired glucose tolerance (IGT) or glycated hemoglobin (A1C) levels higher than normal but not high enough to be classified as diabetes. Few human studies address the relationship between periodontitis and prediabetes or clarify an association between periodontitis and prediabetes. The purpose of this pilot study was to examine the impact of non-surgical periodontal therapy (NSPT) on clinical measures of glycemic control in prediabetes. Methods: Prediabetes measures of IFG, IGT, A1C and periodontal measures of pocket depth (PD), clinical attachment level (CAL), plaque index (PI) and gingival index (GI) were taken at baseline and 3 months in 12 subjects with prediabetes and chronic slight to moderate periodontitis. Blood samples were taken from each subject following an 8 hour fast. This study controlled for changes in medications, body-mass index, physical activity and diet. Results: Comparison of mean prediabetes and periodontal measures from baseline and post-treatment at 3 months demonstrated clinical improvement for both periodontal and prediabetes measures. A mean reduction in PD of 0.27 (p=0.003), CAL of 0.32 (p=0.050) and A1C of 0.19 (p=0.015) reached statistical significance. Conclusion: This pilot study suggests NSPT improves A1C and periodontal measures at 3 months. The robustness of measures is limited due to the small sample size and lack of a control group. Further larger scale studies using a randomized control design would be informative. In a case-control study to determine if glycosylated hemoglobin was elevated in patients with periodontitis who had not been diagnosed with diabetes, periodontitis was associated with a slight elevation in A1C.37 Several limitations were observed in the study, such as use of a Point-Of-Care (POC) instrument to measure A1C instead of a blood draw and standard laboratory test, and no controls for confounders, such as changes in physical activity, weight or diet. This review revealed a gap in the literature for randomized control trials to study the relationship between periodontal disease and prediabetes. The purpose of this pilot study was to determine the impact of NSPT on clinical measures of prediabetes and periodontitis. This was a quasi-experimental design of individuals previously diagnosed with prediabetes and chronic periodontitis. It took place in the Forsyth School of Dental Hygiene clinic located in Boston. The study was approved by the Massachusetts College of Pharmacy and Health Science Institutional Review Board. All participants provided informed consent and received a Forsyth School of Dental Hygiene Health Insurance Portability and Accountability Act (HIPPA) form. Participants were recruited from flyers distributed in local health care facilities, a poster displayed in the clinic, and an ad placed in a local daily paper. Periodontal therapy was provided at the same study site and performed by the same registered dental hygienist to ensure consistency in patient care. Participants included 5 females and 7 males. The age range of participants was 35 to 75. Risk factors for diabetes included level of physical activity, waist circumference, weight, height and diet, and were assessed at baseline and at 3 months. 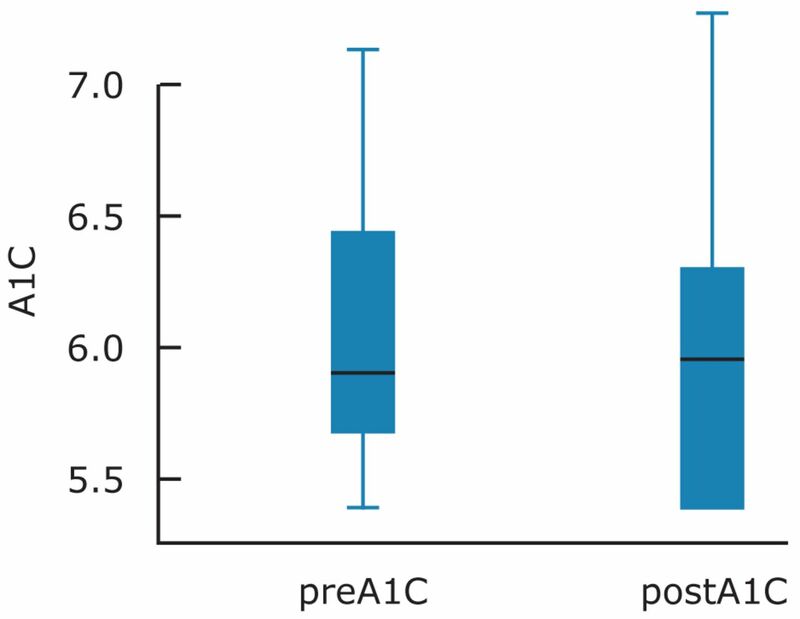 This study measured IFG, IGT, A1C and periodontal parameters PD, PI, GI and CAL for improved clinical measures of prediabetes at 3 months post-NSPT in subjects with prediabetes and treated chronic slight to moderate periodontitis. Periodontal measurements were performed by a single examiner and registered dental hygienist. 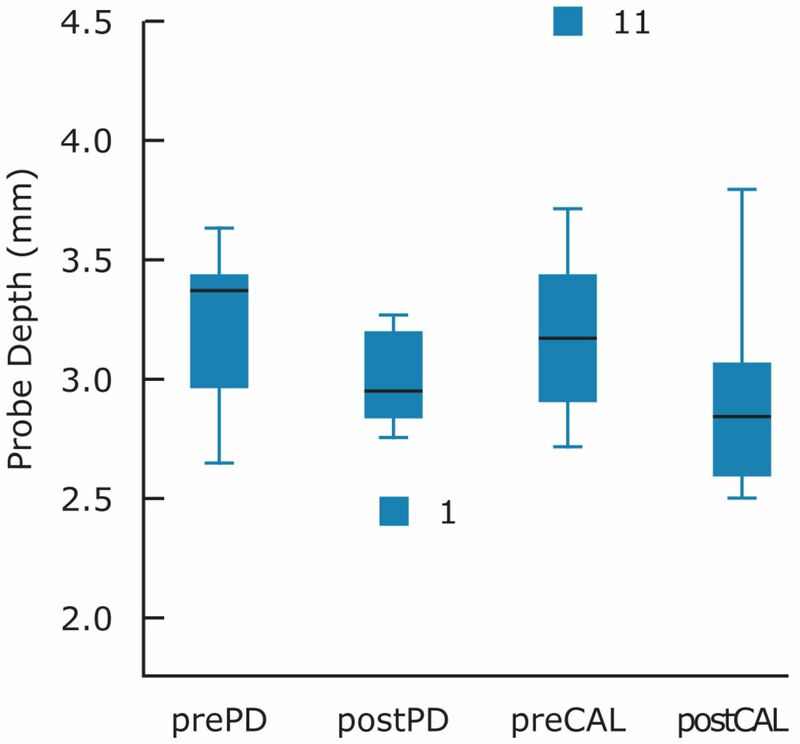 The examiner was calibrated for reproducibility of PD and CAL measurements by conducting a periodontal examination on random quadrants in 10 volunteers. Duplicate measurements were performed with follow-up repeated measures within 1 week to provide intra-examiner reliability information. Intra-rater reliability was established at 99% agreement ±1 mm in 10 subjects. A single registered dental hygienist administered NSPT using the American Academy of Periodontics parameter on chronic periodontitis with slight to moderate loss of periodontal support and oral hygiene instructions at the study site.41 Participants were asked to perform daily oral hygiene, including interdental care and tooth brushing. The OGTT requires consumption of a glucose-containing liquid. A fasting glucose blood test was performed on all participants after an 8 hour fast. After the finger stick, participants were asked to drink 75 milligrams of Trutol® (Thermo Fisher Scientific, East Providence, RI) and to have a second finger stick 1 hour and then 2 hours (±15 minutes) after the first. A finger stick was used to gather a blood sample from each participant at the baseline, and 1 and 2 hour time points. A POC glucometer used in hospitals, StatStrip™ Glucose Hospital Meter (Nova Biomedical Corporation, Waltham, Mass. ), with a 95 to 97% correlation to plasma blood glucose levels was used.42 Finger sticks were done by trained study personnel at the baseline, and 1 and 2 hour time points during the initial examination and at the 3 month examination. A periodontal chart including PD, CAL, GI, PI and number of missing teeth were recorded at baseline and 3 months. PD and CAL recordings were made using a UNC-12 periodontal probe on 6 surfaces of all teeth except for third molars. PD was measured as the distance from the free gingival margin to the base of the periodontal pocket. CAL was measured as the distance from the cemento-enamel junction to the base of the sulcus or periodontal pocket (CAL=PD - (CEJ – gingival margin (GM)). Where the GM was subject to recession and the CEJ was exposed, the distance from the CEJ to the GM was given a negative value. Where the GM covered the CEJ, the distance between the GM and CEJ was given a positive value. The GI was evaluated using a mouth mirror and a UNC-12 probe to determine changes in color, texture, tendency to hemorrhage and presence or absence of ulceration. The gingiva around each tooth was divided into 4 areas corresponding to the mesial (M), distal (D), buccal (B) and lingual (L) surfaces of the tooth, and each of the 4 areas around each tooth was given a score of 0 to 3. The PI evaluated the amount of plaque and soft debris at the gingival margins of the teeth and the 4 gingival areas of each tooth were B, L, M and D and were given scores ranging from 0 to 3. Height and weight were measured by study personnel. A single scale was used for all participants at baseline and 3 months. The scale was placed on a hard, flat surface and checked for zero balance before each measurement. Body Mass Index (BMI) was calculated using a formula: BMI=(weight (lbs. )*703)/height squared (inches2). The waist circumference was measured by placing a tape measure around the abdomen just above the hip bone. The tape was snug but not compressed on the skin and was parallel to the floor. Participants were asked to relax, exhale and then the measure was taken. The NHANES Food Frequency Questionnaire was used to assess dietary habits at baseline and 3 months for changes in the macronutrients, i.e. carbohydrates, fat and protein may impact glycemic control and possibly IGT. Changes in physical activity can also impact IGT and therefore the physical activity inventory from the Behavior Risk Factor Surveillance System was utilized to control for this factor. Data was collected for measures of periodontal disease and prediabetes. The mean for each measure was analyzed by the nonparametric Wilcoxon signed rank test for paired data with statistical significance defined at p<0.05 using SPSS Statistical Software 17.0. The study was completed by 12 patients. The prediabetes measures of A1C, IFG and IGT at 1 hour and 2 hours, as well as the periodontal measures of GI and PI, were compared between the 2 time intervals. PD and CAL were analyzed as the mean whole mouth measures and also isolating number of sites ≥4 mm per individual at baseline and at 3 months. Comparison of mean prediabetes and periodontal measures from baseline and post treatment at 3 months demonstrated an improvement in both clinical measures of prediabetes and periodontal disease (Tables I, II). The measures of IFG, IGT, PI and GI did not reach statistical significance. However, improvements were noted between the baseline and 3 months for all measures. There was a statistically significant difference between the baseline and 3 month measures of A1C (p=0.02), overall PD and ≥4 mm PD (p=0.003, p=0.055) and overall CAL and ≥4 mm CAL (p=0.050, 0.005) (Figures 1, 2). Weight was compared at baseline and at 3 months with a mean increase of 0.05%. In this pilot study, individuals with prediabetes and periodontal disease received NSPT to determine whether there were clinical differences between the baseline clinical prediabetes and periodontal measures and the 3 month measures. Improvement was observed between baseline and 3 months for both prediabetes and periodontal measures. No significant changes in medications, BMI, physical activity or diet were noted. The results showed a statistically significant difference in the A1C (-3%, p= 0.02) from baseline and 3 months. These results are similar to previous studies suggesting that periodontal disease may be associated with elevated blood glucose levels in individuals without DM.34-39,45 Providing NSPT was impactful on the measures for PD and prediabetes for the study participants. Reducing A1C by any degree is beneficial and providing treatment of periodontal disease may lessen the risk for developing DM. Limitations of this study were the small sample size, lack of randomization and a control group which was reflected in the study design. Recruitment of qualified participants was challenging. An affiliation with a medical center where individuals diagnosed with prediabetes could be referred would have been advantageous. Blood glucose measures were conducted using a POC glucometer with a 95 to 97% correlation to plasma blood glucose levels and a POC HbA1C instrument that met the acceptance criteria of having <3% imprecision. Regardless, the POC tests cannot be substituted for a laboratory test. Advantages to using these tests were convenience, ease of use and patient compliance. Studies suggest inflammation as a common denominator in periodontal disease, diabetes, prediabetes and other systemic diseases. However, the mechanisms between inflammation and these diseases are not fully understood. Because periodontal disease is an inflammatory disease, further larger scaled, randomized controlled trials controlling for confounders are needed to demonstrate its effect on blood glucose at a metabolic level. Studies should focus on prevention at the earliest stage possible. In addition, oral health should be included in diabetes prevention and management programs. These findings suggest treating periodontal disease with NSPT reduced A1C levels in prediabetic individuals. Treating periodontal disease had a positive impact on at risk prediabetic individuals and reduced their overall blood sugar glucose. This is important because the incidence and prevalence of diabetes and prediabetes is increasingly becoming a global health concern. Primary care providers are trying to address the diagnosis of diabetes and its complications; however, many health care providers and patients fail to make the oral health connection. The authors thank ADHA, IOH for funding of this grant, J&S Medical Associates – a division JRB Medical Associates, Framingham, Mass., for use of the DCA Vantage. Lori Giblin, RDH, MS, is an Assistant Professor, Forsyth School of Dental Hygiene MCPHS University. Linda Boyd, RDH, RD, EdD, is Dean of the Forsyth School of Dental Hygiene MCPHS University. Lori Rainchuso RDH, MS, is an Assistant Professor, Forsyth School of Dental Hygiene MCPHS University. Dianne Smallidge, RDH, BS, MDH, is an Assistant Professor, Forsyth School of Dental Hygiene MCPHS University. This project won 1st place in the ADHA Sigma Phi Alpha Journalism Award Competition, June 2013, under the master or doctoral level category. Award provided by a generous grant from Johnson & Johnson Healthcare Products, Division of McNEIL PPC, Inc.
National diabetes fact sheet: national estimates and general information on diabetes and prediabetes in the United States, 2011. U.S. Department of Health and Human Services, Centers for Disease Control and Prevention. 2011. National Institutes of Health no. 08-3892. National Diabetes Statistics, 2007. 2008.
. Diagnosis and classification of diabetes mellitus. Diabetes Care. 2011;34(1):S62-69.
. The oral cavity of elderly patients in diabetes. Diabetes Metab. 2007;33(1):S10-18.
. Is periodontal treatment associated with lower medical costs in adults with diabetes? Findings in Blue Care Network 2001-2005. 2009:1-5.
. Underestimation of Periodontitis in NHANES Surveys. J Periodontol. 2011;82(3):337-341.
. Treatment of periodontal disease for glycaemic control in people with diabetes. Cochrane Database Syst Rev. 2010;(5):CD004714.
. The new concept of periodontal disease pathogenesis requires new and novel therapeutic strategies. J Clin Periodontol. 2007;34(5):367-369.
. Etiology and pathogenesis of periodontal diseases. Dent Clin North Am. 2005;49(3):491-516.
. Inflammation and periodontal diseases: a reappraisal. J Periodontol. 2008;79(8):1501-1502.
. Periodontal disease and atherosclerotic vascular disease: does the evidence support an independent association? : a scientific statement from the American Heart Association. Circulation. 2012;125(20):2520-2544.
. Roles of oral bacteria in cardiovascular diseases--from molecular mechanisms to clinical cases: Implication of periodontal diseases in development of systemic diseases. J Pharmacol Sci. 2010;113(2):103-109.
. Porphyromonas gingivalis, Treponema denticola, and Tannerella forsythia: the “red complex”, a prototype polybacterial pathogenic consortium in periodontitis. Periodontol 2000. 2005;38:72-122.
. Periodontal diseases in the United States population. J Periodontol. 1998;69(2):269-278.
. Inflammation and bone loss in periodontal disease. J Periodontol. 2008;79(8):1569-1576.
. Interleukin-6 affects insulin secretion and glucose metabolism of rat pancreatic islets in vitro. Endocrinology. 1990;126(2):1288-1294.
. C-reactive protein, interleukin 6, and risk of developing type 2 diabetes mellitus. JAMA. 2001;286(3):327-334.
. Periodontal diseases. Lancet. 2005;366(9499):1809-1820.
. NIDDM as a disease of the innate immune system: association of acute-phase reactants and interleukin-6 with metabolic syndrome X. Diabetologia. 1997;40(11):1286-1292.
. Chronic subclinical inflammation as part of the insulin resistance syndrome: the Insulin Resistance Atherosclerosis Study (IRAS). Circulation. 2000;102(1):42-47.
. Association between C-reactive protein and features of the metabolic syndrome: a population-based study. Diabetes Care. 2000;23(12):1835-1839.
. Body mass index, diabetes, and C-reactive protein among U.S. adults. Diabetes Care. 1999;22(12):1971-1977.
. The association of leukocyte count, fibrinogen and C-reactive protein with vascular risk factors and ischemic vascular diseases. Thromb Res. 1996;82(3):245-255.
. Interleukin 1beta and interleukin 6, but not tumor necrosis factor alpha, inhibit insulin-stimulated glycogen synthesis in rat hepatocytes. Hepatology. 1998;27(5):1296-1303.
. Dose-dependent effects of recombinant human interleukin-6 on glucose regulation. J Clin Endocrinol Metab. 1997;82(12):4167-4170.
. Executive summary: Standards of medical care in diabetes--2012. Diabetes Care. 2012;35(1):S4-S10.
. Diagnosis, prognosis, and treatment of impaired glucose tolerance and impaired fasting glucose. Evid Rep Technol Assess (Summ). 2005;(128):1-11.
. Community-based population data indicates the significant alterations of insulin resistance, chronic inflammation and urine ACR in IFG combined IGT group among prediabetic population. Diabetes Res Clin Pract. 2009;84(3):319-324.
. Periodontitis is associated with aggravation of prediabetes in Zucker fatty rats. J Periodontol. 2007;78(3):559-565.
. Effect of dietary fat on the development of non-insulin dependent diabetes mellitus in obese Zucker diabetic fatty male and female rats. Atherosclerosis. 2000;148(2):231-241.
. Metabolic diseases and their possible link to risk indicators of periodontitis. J Periodontol. 2000;71(6):898-903.
. Relationship between obesity, glucose tolerance, and periodontal disease in Japanese women: the Hisayama study. J Periodontal Res. 2005;40(4):346-353.
. The extent of alveolar bone loss is associated with impaired glucose tolerance in Japanese men. J Periodontol. 2006;77(3):392-397.
. The severity of periodontal disease is associated with the development of glucose intolerance in non-diabetics: the Hisayama study. J Dent Res. 2004;83(6):485-490.
. Relationship between periodontal status and HbA1c in nondiabetics. J Public Health Dent. 2009;69(3):204-206.
. A pilot study of glycosylated hemoglobin levels in periodontitis cases and healthy controls. J Periodontol. 2009;80(7):1057-1061.
. Periodontal disease might be associated even with impaired fasting glucose. Br Dent J. 2010;208(10):E20.
. Periodontal status and A1C change: longitudinal results from the study of health in Pomerania (SHIP). Diabetes Care. 2010;33(5):1037-1043.
. Association Between Periodontitis and Impaired Fasting Glucose and Diabetes. Diabetes Care. 2011;34(2):381-386. Parameter on chronic periodontitis with slight to moderate loss of periodontal support. American Academy of Periodontology. J Periodontol. 2000;71(5):853-855.
. Performance of the statstrip glucose meter in inpatient management of diabetes mellitus. Diabetol Croat. 2010;39:105-110.
. The analytical quality of point-of-care testing in the ‘QAAMS’ model for diabetes management in Australian aboriginal medical services. Clin Biochem Rev. 2006;27(4):185-190.
. Six of eight hemoglobin A1c point-of-care instruments do not meet the general accepted analytical performance criteria. Clin Chem. 2010;56(1):44-52.
. Severe periodontitis is associated with systemic inflammation and a dysmetabolic status: a case-control study. J Clin Periodontol. 2007;34(11):931-937.